MORE than 5,000 people turned out to greet the sun at Stonehenge on Friday morning. The weather held off for sunrise at the Winter Solstice celebrations and only one arrest was made for drunk and disorderly behaviour. An English Heritage spokesman said: “This year the weather was particularly fine and the ancient stones were bathed in winter sunshine. The atmosphere throughout was good natured. If the annual hustle and bustle of the Christmas rush is getting you down then how about experiencing a different sort of celebration this December? The Winter Solstice celebrations at Chalice Well Garden in Glastonbury, and also at Stonehenge in Wiltshire, may just be the trick for a bit of peaceful meditation. Chalice Well is known as a World Peace Garden. Run by The Chalice Well Trust, it is a place of peace and tranquillity for those of all faiths, and also those who do not have one. People gather together, not in a building or structure of worship, but in the beautiful garden, with the idea being that this will allow a shared acknowledgement of the sacred and divine that members believe transcends borders and differences. The festivals held here are grounded in the following common principles; welcome, stillness, silence, reflection, grace, communion, community, relationship, celebration, gratitude and blessing. One such festival, The Wheel of the Year Festival, is a Winter Solstice meditation, and will be held in the Garden on Friday December 21 between 12.00 and 12.30pm. On this date people will be gathering at the Well Head at 12pm for celebration and meditation until 12:30. At 12:30 they are invited to join around the fire on the Lower Lawn for informal ’conversation’, the hope being that this will be an opportunity for people to share ideas, thoughts and beliefs, and perhaps also a chance to increase connection through understanding. Refreshments will be available on the day. If you would prefer to experience the Winter Solstice like the druids do, then you may want to undertake a tour to Stonehenge instead. Each year on December 21st, visitors from around the world gather peacefully at the English Heritage site early in the morning to mark the most important day of the year at Stonehenge, and to see the sunrise above the stones. The Winter Solstice is an ad hoc celebration that brings together England’s New Age Tribes (neo-druids, neo-pagans, Wiccans) with ordinary families, tourists, travellers and party people for a magical and spiritual experience. Stonehenge is carefully aligned on a sight-line that points to the winter solstice sunset. At dawn the central Altar stone aligns with the Slaughter stone, Heel stone and the rising sun to the northeast. The exact time for the Solstice on the 21st is 11.39pm, UK time. The sunset is at 3.53pm and the sunrise at 8.04am. Coach tours to Stonehenge are available and some come with a guide, allowing you to spend 1-2 hours inside the stone circle and witness the sun rising, Druid Ceremony and festivities. The complex is usually roped off, meaning visitors normally observe the stones from a distance, but pre-booked winter solstice tours do allow you to be amongst the stones for a short period of access before the site opens to the general public, likely to be from approximately 7.30 to 9.00am. How exciting! 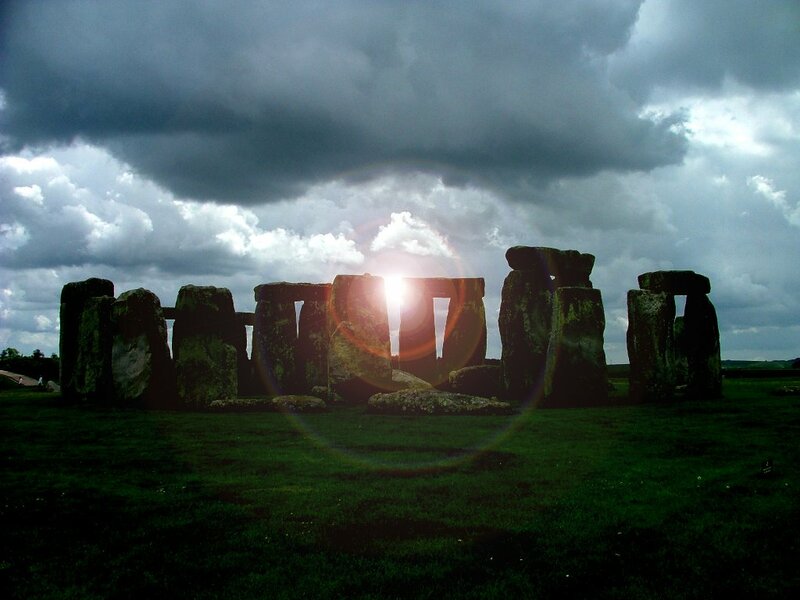 If you fancy joining in in the solstice celebrations, let us know where and do send us a picture! Within the Stonehenge World Heritage Site, the National Trust manages 827 hectares (2,100 acres) of downland surrounding the famous stone circle. Walking across the grassland, visitors can discover other prehistoric monuments, including the Avenue and King Barrow Ridge with its Bronze Age burial mounds. Nearby, Winterbourne Stoke Barrows is another fascinating example of a prehistoric cemetery. While Durrington Walls hides the remains of a Neolithic village. The best approach to the famous stone circle is across Normanton Down, a round barrow cemetery dates from around 2600 to 1600BC. Ancient people probably assembled the massive sandstone horseshoe at Stonehenge more than 4,600 years ago, while the smaller bluestones were imported from Wales later, a new study suggests. The conclusion, detailed in the December issue of the journal Antiquity, challenges earlier timelines that proposed the smaller stones were raised first. The new timeline, which relies on statistical methods to tighten the dates when the stones were put into place, overturns the notion that ancient societies spent hundreds of years building each area of Stonehenge. Instead, a few generations likely built each of the major elements of the site, said Robert Ixer, a researcher who discovered the origin of the bluestones, but who was not involved in the study. The Wiltshire, England, site of Stonehenge is one of the world’s most enduring mysteries. No one knows why prehistoric people built the enigmatic megaliths, although researchers over the years have argued the site was originally a sun calendar,a symbol of unity, or a burial monument. Though only some of the stones remain, at the center of the site once sat an oval of bluestones, or igneous rocks (those formed from magma) that turn a bluish hue when wet or freshly cut. Surrounding the bluestones are five giant sandstone megaliths called trilithons, or two vertical standing slabs capped by a horizontal stone, arranged in the shape of a horseshoe. Around the horseshoe, ancient builders erected a circular ring of bluestones. The sandstone boulders, or sarsens, can weigh up to 40 tons (36,287 kilograms), while the much smaller bluestones weigh a mere 4 tons (3,628 kg). [In Photos: A Walk Through Stonehenge]. Past researchers believed the bluestone oval and circle were erected earlier than the massive sandstone horseshoe. But when Darvill and his colleagues began excavations at the site in 2008, they found the previous chronology didn’t add up. The team estimated the age of new artifacts from the site, such as an antler-bone pick stuck within the stones. Combining the new information with dating from past excavations, the team created a new timeline forStonehenge’s construction. Like past researchers, the team believes that ancient people first used the site 5,000 years ago, when they dug a circular ditch and mound, or henge, about 361 feet (110 meters) in diameter. But the new analysis suggests around 2600 B.C. the Neolithic people built the giant sandstone horseshoe, drawing the stone from nearby quarries. Only then did builders arrange the much smaller bluestones, which were probably imported from Wales. Those bluestones were then rearranged at various positions throughout the site over the next millennium, Darvill said. “They sort out the local stuff first, and then they bring in the stones from Wales to add to the complexity of the structure,” Darvill told LiveScience. The new dating allows the archaeologists to tie the structure to specific people who lived in the area at the time, Darvill said. The builders of the larger sandstone structures were pig farmers found only in the British Isles. In contrast, the bluestone builders would’ve been the Beaker people, sheep and cow herders who lived throughout Europe and are known for the distinctive, bell-shape pottery they left behind. The new timeline “connects everything together, it gives us a good sequence of events outside, and it gives us a set of cultural associations with the different stages of construction,” Darvill said.